The iMac (24-inch, 2.8GHz Intel Core 2 Duo, Early 2008) screen introduced in early 2008 is almost identical to the iMac Core 2 Duo Aluminum 24-inch. This is the all-in-one desktop computer in a glass and aluminum one-piece casing behind the 24” screen, mounted on an aluminum stand with an adjusting hinge. But the processor Intel Penryn is of a higher class. It got the fastest bus and the largest cache of the time. This mobile type processor is also more energy efficient than its Merom predecessor. The RAM speed had been also boosted up to 800 MHz. The iMac (24-inch, 2.8GHz Intel Core 2 Duo, Early 2008) features a 2.8 GHz Intel “Core 2 Duo” processor (E8235), with two independent processor “cores” on a single silicon chip, 2 GB of RAM, a 320 GB Serial ATA hard drive (7200 RPM), a slot-loading DVD+R DL “Super Drive”, ATI Radeon HD 2600 PRO graphics with 256 MB of GDDR SDRAM (PCI-Express), a built-in iSight webcam, a microphone and stereo speakers, as well as 1 Firewire “400”, 1 Firewire “800” and 3 USB 2.0 ports. It also has built-in draft and enabled AirPort Extreme (802.11g) and Bluetooth 2.1+EDR, Gigabit Ethernet and mini-DVI capable of supporting a second display. The cooling system is CPU controlled and the in-built speakers are mounted beneath the 24” screen for the sound to bounce off the desk or other surface. The speakers’ grills also work as the vent ones. The iMac (24-inch, 2.8GHz Intel Core 2 Duo, Early 2008) is shipped with an ultra-thin aluminum Apple Keyboard and Mighty Mouse. Introduced on April 28, 2008. Processor type: Core 2 Duo (E8235) “Penryn”. On-Board Ram: 2GB, DDR2 800MHz (no slot empty). Video: 24″ TFT active matrix LCD, 1920 x 1200 pixels max resolution, viewing angle: 178° horizontal and 178° degrees vertical. Graphics: Radeon HD 2600 PRO graphics with 256 MB of GDDR3 SDRAM (PCI-Express). Storage: 320 GB, 7200-rpm Ultra ATA-66, hard drives up to 750 GB and 1TB available for BTO models. Input\Output: 3x USB 2.0, 1 Firewire 400, 1 Firewire 800, built-in microphone, built-in speakers, audio out, audio input/output, iSight webcam. Preinstalled OS: X 10.5.2 (9C2028). Dimensions: 20.5 x 22.4 x 8.1 inch. Apple Model No: A1225 (EMC 2211). Officially, this iMac supports RAM up to 6 GB, but some users reported they had successfully installed 8 GB. Their computers worked fine and didn’t crash. Yet, it is up to you whether to follow this tip or not. 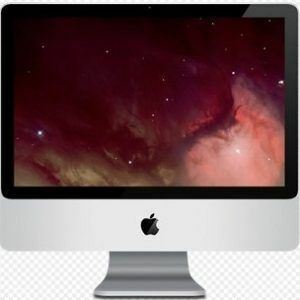 Trade in your used iMac for fast cash: We buy even broken iMacs for best price online. Instant quote, free shipping, fast payment: iMac for sale. Early 2008 24″ iMac Overview. Video published by dosdude1 on August 10, 2015.